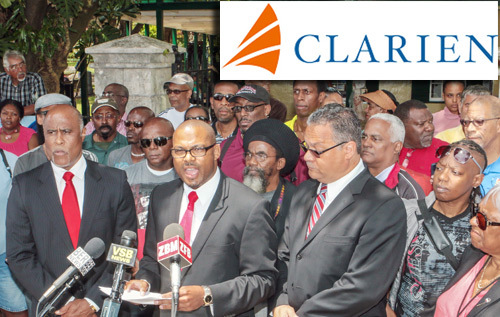 Clarien Bank recently confirmed engagement in significant dialogue with representatives of the People’s Movement and its commitment to continue to provide a broad range of high quality products & services to members of the community. Further to that productive discussion, Clarien is offering Union members a premium increase of 1/8 of 1 percent (0.125%) interest over and above published interest rates on all term products not including promotional products of 1- month or higher, subject to other standard terms and conditions. Union members must produce valid union membership documentation to take advantage of this exclusive offer, which begins 30 June 2014. Interested parties should contact their Clarien Relationship Manager or visit either Clarien Bank branch in Hamilton or Paget for account opening and terms. For details on rates and terms visit www.clarienbank.com. We thank the People’s Movement for the highly informative discussion and look forward to continuing a positive working relationship with the organization.